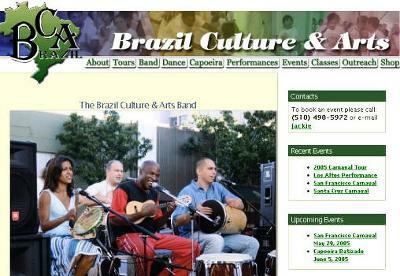 Caption BRAZIL CULTURE & ARTS is an organization dedicated to bringing Brazilian culture history dance and art to the Bay Area. Under the leadership of Mestre Beiçola a native of Rio de Jainero the organization includes a Capoeira performing group Capoeira Narahari and a dance company Sambão as well as several on-going samba & capoeira classes for children and adults throughout the Bay Area. BRAZIL CULTURE & ARTS offers rich programming and performances in the martial arts dance and music of this exceptional South American nation. The organization boasts Capoeira academies in Brazil and America a Rio-style samba school and performing company as well as a variety of ongoing classes in the San Francisco Bay Area. BRAZIL CULTURE & ARTS sponsors cultural tours to several Brazilian states each winter and summer. Scores of people have enjoyed these tours which offer firsthand experience of the country's finest masters of the arts and a unique insight into the unparalleled spirit of the Brazilian people.